Trying to multitask with a few pots bubbling on the stove almost always ends with the same fate — you forget how long your pasta has been cooking until it’s too late. 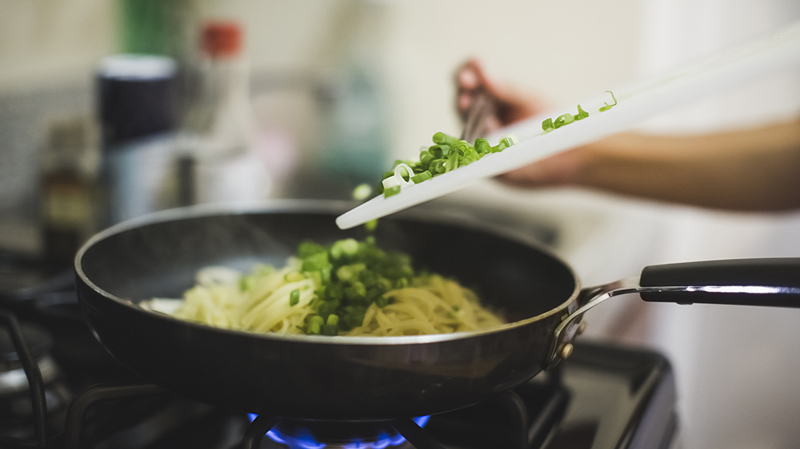 If you’ve gotten distracted and left your noodles on the burner one too many times before, you might be relieved to know that you don’t always have to throw them out. Since noodles are such a time-sensitive food, it’s easy to accidentally overcook them. Not only do overcooked noodles have a mushy and unpleasant texture, but when you boil them too long, you change their glycemic index, which can increase your blood sugar. So not only are you altering their taste and texture but their nutritional value as well. Minor distractions can cause a meal to be ruined. But next time this happens, you don’t have to throw out the noodles. Instead, find a way to save them. To avoid overcooking your noodles in the first place, set the timer for two minutes less than the directions on the package recommend. Sample a noodle once the timer dings to see if it’s cooked to your liking. Properly cooked noodles will be slightly firm yet tender, otherwise known as al dente. Once they’re done, immediately drain and rinse with cold water to prevent the noodles from cooking further. One solution to overcooked noodles is to throw them in a pan with a little butter or olive oil and sauté them over low heat. This will crisp them back up a bit, allowing you to salvage dinner. Add some garlic or Parmesan cheese for an extra kick — and to disguise the overcooked flavor of the noodles. If you already have some onions, garlic and tomato sauce warm and ready to go, use them to make pancakes. Yes, really — pancakes. Add a little of those ingredients to the noodles along with a whisked egg, mix well, and form into individual pancakes. Fry with some butter or olive oil on a flat griddle, and you’ve got yourself a delicious meal in minutes. There are ways to make it seem like you didn’t overcook the pasta without having to sauté the noodles or make a noodle pancake. You can simply cover the noodles with a rich sauce and mix well. This takes away the “slimy” taste that overcooked noodles carry, leaving you with a delicious, slightly softer noodle. Also, by adding crunchy vegetables, such as zucchini or bell peppers, to the dish, you can provide a much-needed al dente texture. Fix them the old-fashioned way — with water and ice. Drain the noodles in a strainer, and rinse well with cold water. Place some ice cubes on top of the noodles while rinsing to make the water even colder. Not only does this stop the cooking process immediately, but it also rinses away some of the starch coating and prevents the noodles from sticking together.